For those of you who are not aware of the scheme, it involves Jackson Grundy donating a percentage of their fees to local community projects and charities. We have been piloting the scheme in our Moulton and Earls Barton offices and are looking to raise awareness before rolling it out to other areas. The groups which have each received donations in excess of £1000 include: Brixworth Country Park, Brixworth Village Hall, Moulton Players, Friends of Moulton Library, Moulton Church, Moulton Magpies FC, Moulton Primary School, Overstone Village Hall, Earls Barton Infant School, Ecton Parish Council and The Hannah Payne Trust. 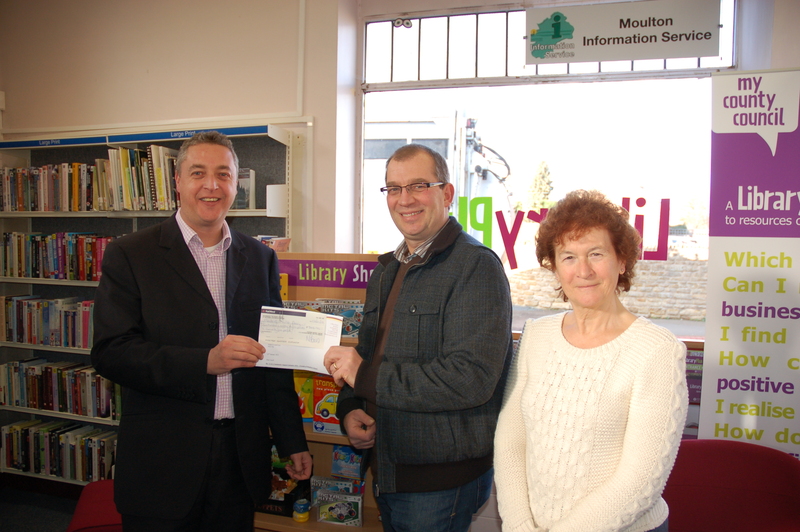 Pictured: Brian Evans from Jackson Grundy (left) handing over the latest cheque to Andrew Tresias from ‘Friends of Moulton Library’. A big thanks to all our customers who have participated in the scheme so far! Next milestone is £50,000!